This persona was initially adopted by Adrianne Palicki, the vintage actress who portrayed attiring Wonder Woman Jacket. This goes for all the young women who practically dream to be like the divine super-heroine and pour their charms with enchanting bliss. We dig that every woman wants to Wonder Woman Jacket such gear at least once in her lifetime and if you get to do so, hats off to you. On this day, it is not that difficult, welcome to the era of high technology and online shopping wonders. What an amazing outerwear which is the combination of three diverse shades. Maroon, blue and yellow. The logo is what strikes first into your vision. After that there are stand collar in yellow color. This gear has been produced from genuine leather / faux leather material. There are pockets given on waist. 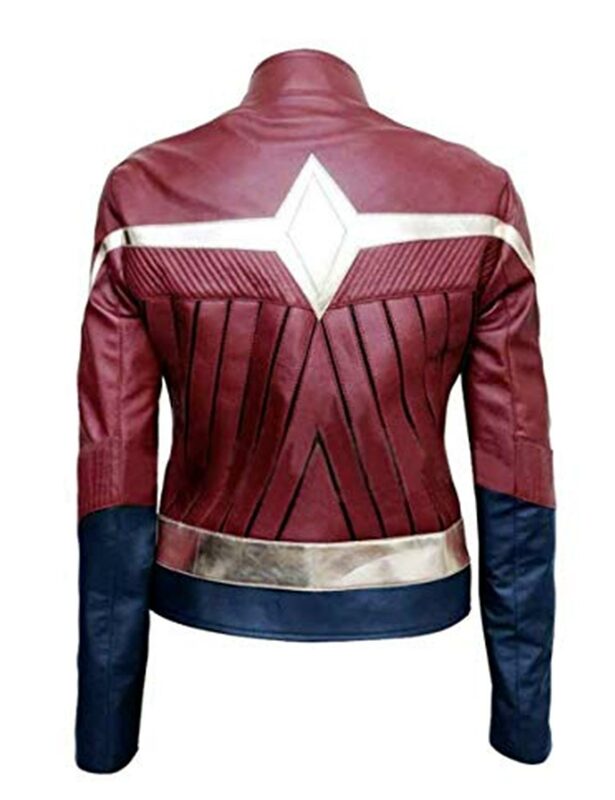 While on the other hand long sleeves with star patches on biceps the back of the Wonder Woman Leather Jacket is plain and maroon in color. This attire concludes with front zipper closing technique and yellow hemline for perfection. A worthy investment. Good for $129 It's almost like a cropped jacket but made me feel a little bit hotter than expected. I fold the sleeves every now and then but I can't get enough of it. I'm falling for this wonderful Wonder Woman Jacket. 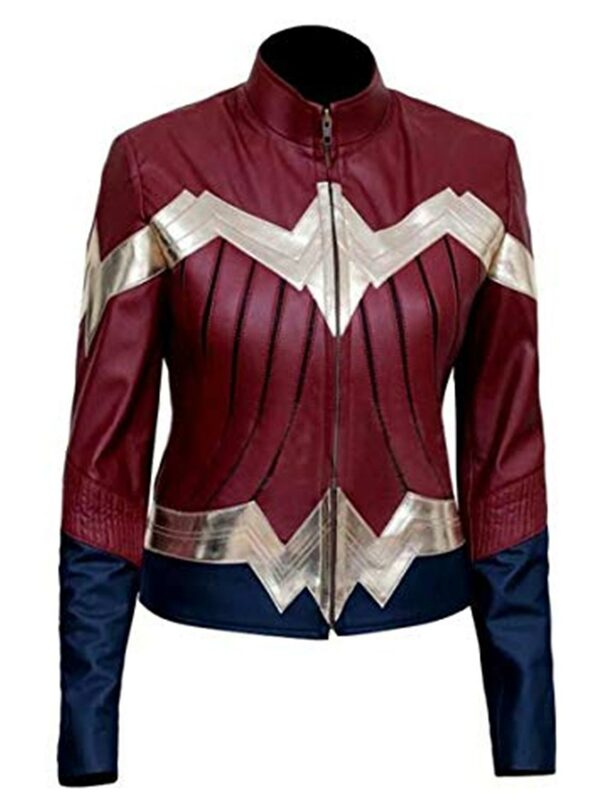 I'm falling for this wonderful Wonder Woman Jacket. I never knew that I would end up being captivatingly consumed by a faultlessly fabulous Wonder Woman jacket… was looking for something famous “Feminine Trendy”… and ended up here… gosh I wasn’t hoping for something heroic for the ladies enchant elegances… but yeah before getting this I really went to see the trailer for the Wonder Woman film… and I feel it was time for the girls to get out of their fragile shells and act like a man lol… Confidence and Conviction is the key to manliness that leads to a dignifying glory and victory. After figuring out my size and lengths and talking to the CR of the website… I was satisfied to bring in some real solid deal for myself for the first time… just got it yesterday and Im shocked with its on-screen faithfulness… Thank you so much hjackets to taking this always-in-a-suspicion kinda lady towards loyalty of faithfulness. You guys rock and I hope you keep going on like this for days, decades, and centuries. Really Love this Outfit and can’t get enough of it. Amazing and well crafted. Thank you so much for this auspicious outfit that showcases splendor as soon as you put on. Im loving it!